Is the Left really losing elections across the world? The Left is retreating around the world. The Great Recession has produced a landscape so favourable for right-wing parties, their opponents can only feel sorry for themselves as they watch support drain away from them. At least, so goes the popular narrative. At the last Labour Conference, Douglas Alexander said: “for a decade around 1997, the centre left was defeating the right. Now the centre right is beating the left”. Fraser Nelson agreed, with the assertion “across Europe centre-Left parties are in electoral retreat”. But an analysis of elections over the last 12 months doesn’t bear out the argument that the Left is on a losing streak. What we see instead is that while the main centre-left parties have indeed lost some ground to the main centre-right parties, left and centre-left parties have generally done slightly better than parties of the right and centre-right. The results come from all country-wide parliamentary general elections held in Europe, North America and Australasia in the last 12 months, totalling eight elections. See here for the full methodology. 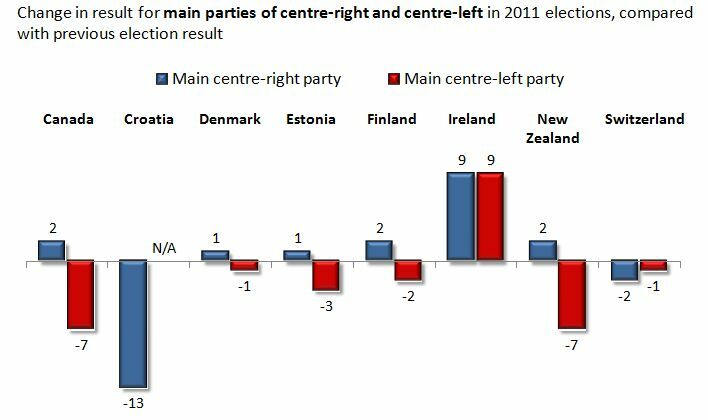 If we look just at the performance of the main centre-left party in each country, and compare it with the result for the main party of the centre-right, we do indeed see a drop for the centre-left. In six of the eight elections, the main centre-left party lost support; only in Ireland did it gain, and that was at the expense of the centre rather than of the right. The average swing is about 2pts to the main centre-right party. But that’s only part of the picture. If we count all parties of the left and centre-left, and compare them with all parties of the right and centre-right, the result is reversed. Commentary on the difficulties facing the Labour Party – leading in nearly every poll for over a year – sometimes puts me in mind of Bill Shankly, the Liverpool manager of the ‘60s and early ‘70s. Responding to a journalist’s question about a supposed crisis at the club, the great man said, “Ay, here we are with problems at the top of the league”. Likewise, despite Labour’s consistent polling lead, the impression from the comment pieces, blogs and tweets is of a party struggling to find supporters. 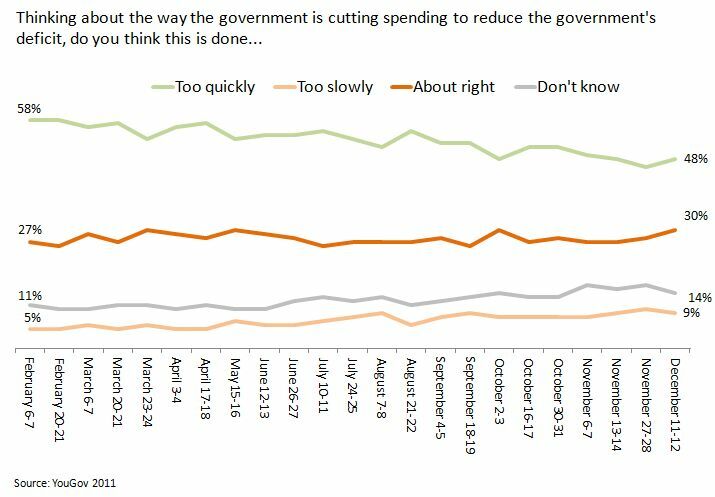 The logic is that, firstly, Labour’s lead is smaller than might be expected against a government undertaking such spending cuts, and, secondly, that the government is likely to recover and overhaul that lead between now and the next election. The first of those points may be subjective, but the second can be tested against what’s happened in the past. Mark Pack has compiled the voting intent results from all opinion polls published since 1945, which allows us to do just that. 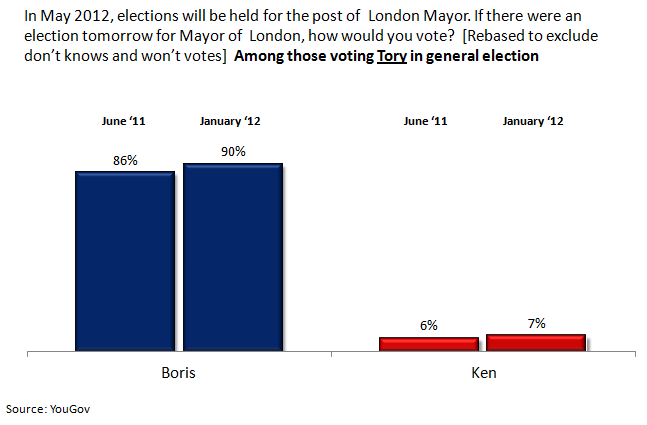 November 2011 marked 18 months since the last general election. At that point, Labour were on average 4.6pts ahead of the Tories, a score that has since slightly reduced due to Cameron’s veto bounce. 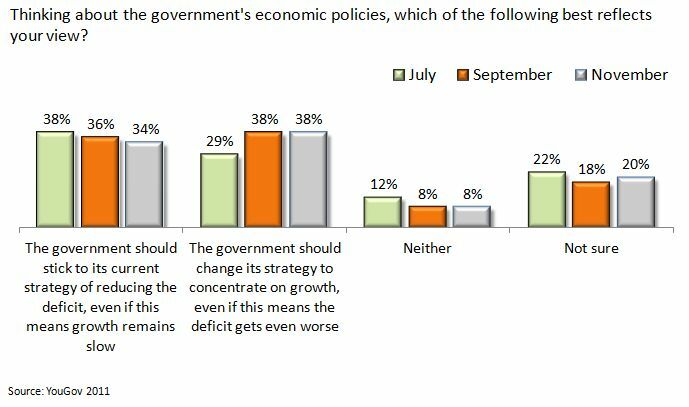 Comparing this score with opposition parties’ poll scores relative to governments’ 18 months after past general elections allows us to benchmark how Labour are currently doing. It also allows us to estimate Labour’s result in the next general election. 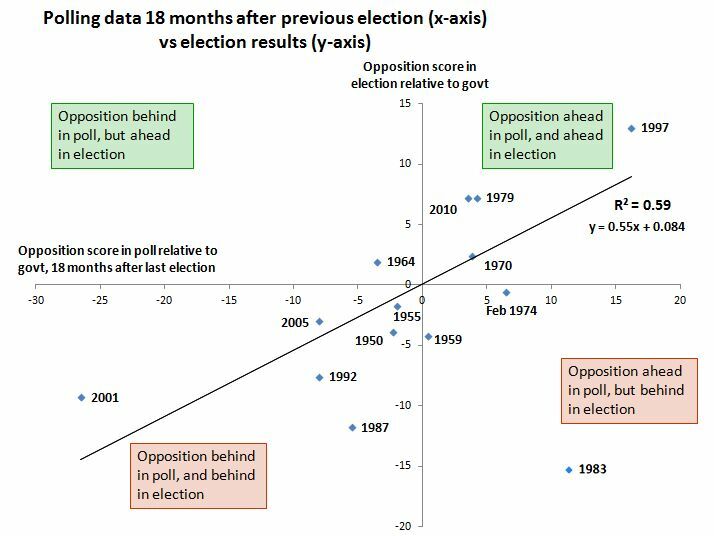 A regression analysis of historical polls 18 months after an election, relative to scores in the next general election can provide a model to analyse where we are now (see below for the detailed methodology). The analysis suggests that performance at this point is in fact a pretty good prediction of performance at the next election: it predicts nearly 60% of the result of the next election, with a very high level of confidence (p=0.002). If a party is leading at this point, it tends to be leading at the election. However, the gap between the government and the main opposition partly typically halves over the remainder of the parliament. Therefore, given the current position, the historical data suggest Labour should expect to win the next election by a small margin, of a little over two percent. 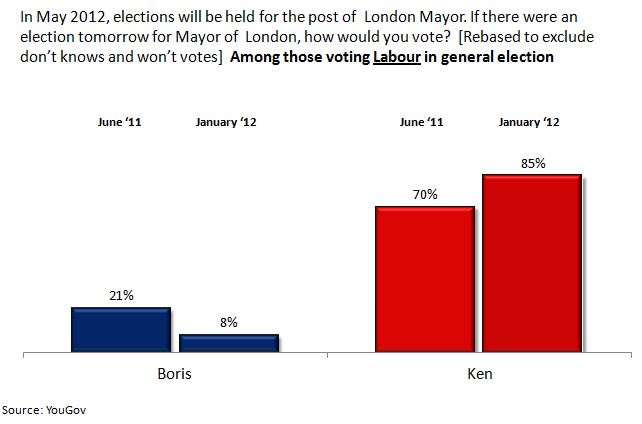 However, these polls weren’t conducted equally far before the forthcoming election. The Feb ’74 election, for example, was 44 months after the previous election, while the 2010 election was 60 months after the previous one. So, as well as comparing election results with polls 18 months after the previous election, we can compare the results with polls exactly two years before that election date.